The Hluboka castle (also known as Frauenberg castle) lies on a hill overlooking the city of Hluboká nad Vltavou in the south of the Czech republic, about 10km north of Ceske Budejovice. 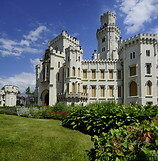 It is one of the most beautiful castles in the Czech republic. The castle is surrounded by a beautiful and carefully choreographed park covering the area of 58 hectares. 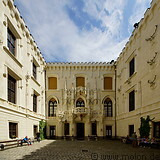 It was originally founded as a royal castle in the 13th century by the Czech King Premysl Otakar II and was modified four times over the course of the centuries. The current neo-gothic Tudor appearance dates back to 1871, when the Schwarzenberg family, who had owned the castle since 1661, remodeled it according to the royal Windsor Castle.